Ready to impress your friends with a stunning porch this BBQ and pool party season? Give us a call today! 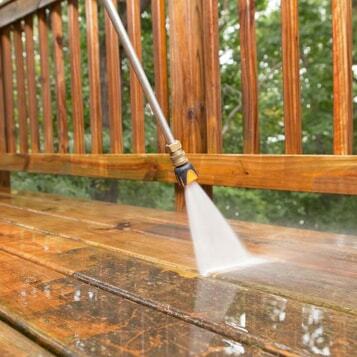 Get Superior Deck Cleaning and Restoration. You won’t be disappointed! Having your wood deck freshly cleaned and sealed not only makes it more pleasant when entertaining friends but it is also very important preventative maintenance when done correctly. Professional deck cleaning and sealing will add years to your deck, and can save you valuable time and money down the road. Preserving your deck is so much more cost-effective and less stressful than having to build a new one. Superior Cleaning’s unique deck washing process safely removes dirt, mildew, algae, and discoloration, leaving the wood clean and primed for our high-quality deck sealant. We use a combination of a non-abrasive cleaning (in which we allow the cleaner to do the work), followed by a low-pressure washing rinse that will not damage your deck and is guaranteed to give the perfect surface for sealing. Rest assured, we are very conscious of your deck’s surroundings, especially the well being of your plants and landscaping. We take the utmost care in making sure your outdoor space is not harmed in any way. Superior Cleaning Service has full and comprehensive insurance, and all work is performed with the owners/manager present.